He is a plush black cat, with soft fur and an ever-inquisitive nature. He isn’t much for cuddling, but when he chooses to join you on the bed or sofa you feel honoured when the purring starts. He is demanding, as cats often are, greeting us on our arrival home with meows requesting his supper. He torments the dog, he is enthralled by the ferrets, he has destroyed my drapes, he has tried to escape his house “imprisonment” several times, and he has quickly become a linchpin in our home. In another community he would, very likely, be dead. We adopted Sirius Black cat in September of last year, fulfilling the Intrepid Junior Blogger’s long held dream to own a cat. We went to the Fort McMurray SPCA, and after considering a long list of candidates it was this small black cat (who thanks to his appetite is no longer so small) who captured our hearts. As a black cat he is among one of the ones often not adopted. In other communities such animals are often euthanized as the shelter fills with new arrivals, and so, our little Sirius Black, who now owns our hearts and directs our actions, would very likely not even be alive today without the local SPCA. This is a fact that hurts me, because Sir Black has become a central focus in our house. 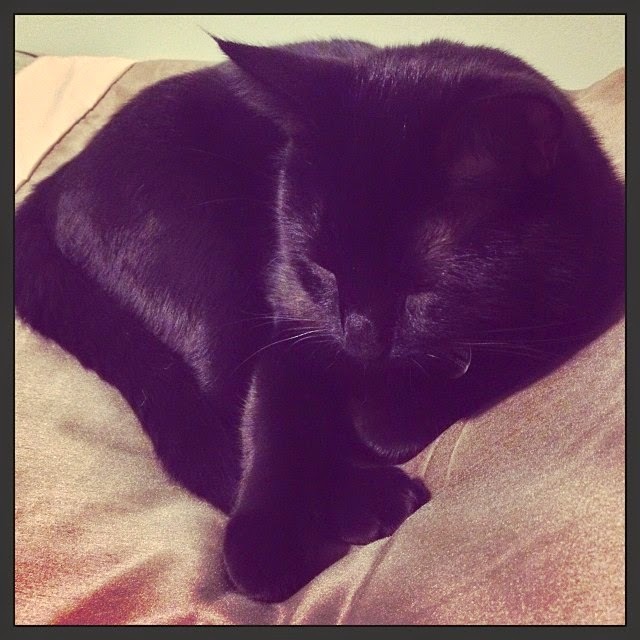 The IJB, heading into high school, has indicated that when she leaves home she intends to take Sir Black with her, and I know that while I will miss her fiercely when that day comes so too will I miss this not-so-small black cat. He is a part of our lives. He is, in fact, family. This weekend I am a participant in Dancing With the Stars Wood Buffalo, a fundraiser for the Fort McMurray SPCA. There is one reason and one reason alone that could get me to overlook my inability to dance, my nerves and my hesitance to make a fool of myself publicly: the incredible bond between people and animals. Having worked in veterinary clinics I have witnessed human-animal bonds that can only be described as love stories. I have seen grown men, big burly ones, cry when a pet was ill. I have seen the joy of a reunion between an owner and an injured, but recovering, pet. I have seen the sort of unconditional and pure love that often eludes us in our human interactions, but that is the hallmark of our relationship with our pets. I jokingly refer to my house as a zoo. I have a dog, a cat, and three ferrets. I am the lady you see with a shopping cart loaded with cat litter and cat food and dog food and pet treats and dog shampoo and cat toys. I am the one with the veterinary clinic on speed dial. I am the one who has invested in her pets with her wallet, but even more so with her heart – and it is because they give me far, far more than I could ever hope to give them. I must admit something. I believe life without animals is hollow, and lonely. I know there are those who don’t like animals, or who don’t derive the same joy I do from being with them, but this is so foreign to my existence that it seems to be from a different planet. To me pets are life. Pets may not be your whole life, but I believe they have the ability to make your life whole. I am going to ask you something today, and it is a very rare request. If this blog has ever touched you – made you laugh or cry, made you think or even made you angry – please go to Dancing With the Stars and vote. Vote for me if you wish, or vote for one of the other couples dancing this weekend. It costs you $20, and it isn’t for me, you see. It is for Sirius Black, who was once a stray cat but who is now so very loved, and all the other animals the SPCA has cared for over the years, and all the ones yet to arrive at their doorstep. It is for the human-animal bond, one that often goes back to our childhood with memories of a beloved pet. It is to celebrate that bond, and the animals who have loved us in a way that touched our hearts, and healed our souls. I would also ask that you share the link with others. Tweet it, Facebook it, or email it to those who you know or think may have felt that connection with an animal. You see in the end this isn’t about dancing or an event or voting. It’s about a small black cat, and thousands like him, the animals who are not our whole lives, but who make our lives whole.